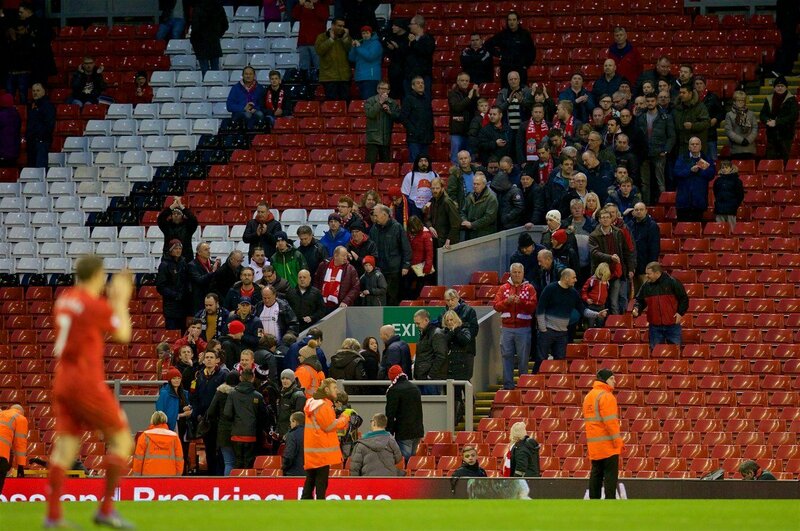 The whole city knew about the planned walk out at Anfield on Saturday. In the days leading up to it the general consensus, amongst the Reds and Blues I know, was one of unanimous support. The only issue was whether the protest went far enough. Would it be the same inside the ground though? Outside of my relatively small circle lay tens of thousands of supporters from all corners of the city and the world. Would they feel the same acute sense of injustice as I did? Ian Ayre chose to address the media the day before, presumably in an attempt to convince the undecided not to take part; if anything his remarks only served to strengthen resolve. If Carlsberg did ill judged interventions… Well you get my meaning. There was no getting away from it, the call to arms issued by ‘Spirit of Shankly’ and ‘Spion Kop 1906’ had captured the imagination and everyone was talking about it. How many would heed the call? The thought of the protest falling flat on it’s face was almost too hard to bear. A ‘damp squib’ would send the worst of messages to the club and the Premier League. If Liverpool fans , famed for their ‘bolshyness’ and spirit of defiance, couldn’t organise an effective protest against such a blatant rip-off, then ours and other clubs could clearly do whatever they liked. So to the game. I’d only been in the cab thirty seconds, when the driver asked me “what do you think of the walk out lad?” What was his angle? Was he on a wind-up? Did I feel like getting into a debate on the ride up to the ground? “Well I’ll be walking out” I said, fully prepared to be told how it was a waste of time and other assorted put downs. My nerves about the protest began to ease and I sat back and listened. He was preaching to the converted, but he spoke with such passion I began to wonder if I could get him a spare for the game. I arrived at the turnstile around fifteen minutes before kick-off. A small queue had formed. Behind me a group of lads were talking about the walk-out. would the ‘out of town’ support join in? There was some understanding for the predicament of these fans. “I’m walking out like. But if you’d come all the way from Australia or something and you had a young kid with you, would you walk out?” Said one of the group to his mates. “Too right I would. I’d tell the kid I’m doing it for him. So he can go to games in the future.”. The game felt like an afterthought, a side show to a drama being played out in the stands. From my seat, under the scoreboard, I have a great view across The Kop. I saw none of the usual colourful banners. The huge crowd surfer was also absent. Instead black flags were being unfurled at the font of the famous old stand. The only ounce of colour on show was a banner with a picture of a Liver Bird holding a Kopite upside down; money falling from his pockets. The relationship between supporter and club ingeniously and succinctly summed up in one image. I stared across the pitch to the Main Stand. To the right of the directors box a group of fans had rolled out another message for Ian Ayre. 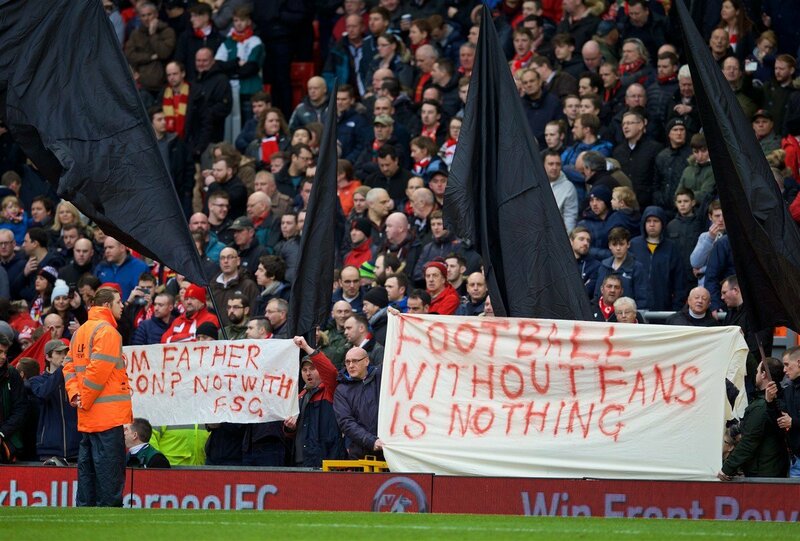 “Football without supporters is nothing.” I could see smaller banners around the ground too and began to feel confident that there would be a significant demonstration of discontent. Around me though there was unease. As the game was about to start the Liver Bird banner was carried to the back of The Kop, a black flag in pursuit. As the lads carrying them ascended the step applause broke out throughout the stand. A few of us in 109 stood and joined in, but interestingly others didn’t. As we sat back down conversations between supporters broke out. When you’ve sat next to the same people for years, friendships develop. There is a camaraderie and mutual respect that makes going to the game an almost family occasion. Some of these friendships were being tested and you could see it was weighing heavy on some. Another spoke up. “Look mate, I understand why people are doing it, but I’m not walking out. I don’t agree with it.” There was sadness in his voice and he was almost apologetic. The debate was friendly, respectful and in the end there was an agreement to disagree. Many will fail to see that even those who stayed behind yesterday are appalled by the club’s decision on pricing. They only disagree with what form the protest should take. In attempting to divide supporters and play Kopites off against one another they are making a fundamental mistake. Revulsion at rising prices is universal. I can’t remember an awful lot about the game. It seemed to be trundling to another painful draw when in the second half Liverpool finally made their dominance pay. Sunderland had been at best mediocre and had we had a striker worth the name, we’d have been looking at a trouncing. Still as the 77th minute approached, a 2-0 lead seemed comfortable. The opposition had offered nothing and three points seemed in the bag. I could feel the tension building. I can’t see the clock from my seat and kept glancing nervously at my phone. Then a few people got up and started making their way for the exits. I wasn’t sure, but I thought this must be it. I turned to the lad in the seat next to me. I knew he was staying. I shook his hands and said “listen I’m walking out. See you next game.” He nodded his understanding. There were no hard feelings. I know that most of those who stayed have been going to the game for decades. Leaving during the match is a painful decision they just couldn’t make. I will never condemn them. I got to the bottom of the stairs and noticed the gates were still locked. I wandered over to the gap down by the corner flag at the bottom right hand corner of The Kop. I looked up at the clock and saw I had jumped the gun. Quit a few had joined me and we were patiently waiting for the protest to start. As the seconds ticked by the crowd broke into chants of “Liverpool” before an early rendition of “You’ll never walk alone”. Anticipation grew.. When would it start? How many would walk out? The tension was palpable. I looked out across the pitch again towards the Main Stand. There was an exodus there too. It was happening and it seemed like the ground was emptying. These scenes were unprecedented in my lifetime. The gates opened and I walked towards them, looking over my shoulder as I went. The concourse under The Kop was packed. The sound of supporters chanting in the confined space was thunderous and I joined in carrying the tune outside into the streets. We marched down the road. You would think it was full time. The songs continued to echo into the night. I’d agreed to meet the lads in the pub afterwards. As I got there I found it was full of Sunderland supporters. At 2-0 they’d staged their own mini-walk out. It was now 2-1 and within minutes the scores were level. The mood amongst them was far from jubilant though. A reminder, if we need one, that this isn’t a Liverpool issue. This is a fight all supporters need to engage with. 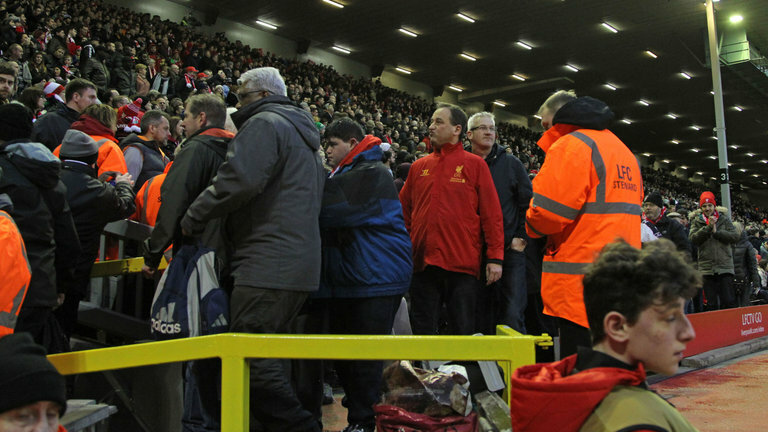 On a historic day at Anfield, Liverpool supporters have just shown the way forward. Well done. A principled man.